How do you commemorate an existence that had something of the Being she had kinship with? For those who knew her and grew up breathing the breath of her breath Mrinalini Sarabhai, who straddled a century as a legendary Bharatanatyam dancer and a beacon of love, is an idea that melted into the air. She is like a distant empathetic strain from the violin (Symphony) that rose and spread from under the tree that keeps growing along with a creeper as part of even the completely renovated amphi-theatre Natarani of Darpana Academy, now equipped with state-of-the-art technology. Queen Natarani strode in with elegance and grace last Friday to the exhilaration of art lovers who had waited for three and a half years. 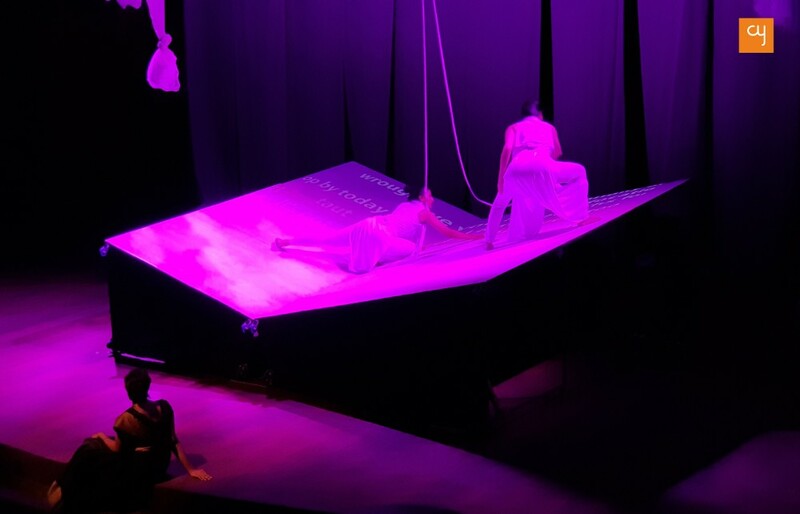 Yadavan Chandran is known for his eye and ear as much as for his aesthetic sense to project with multimedia an idea or feeling in a performance. 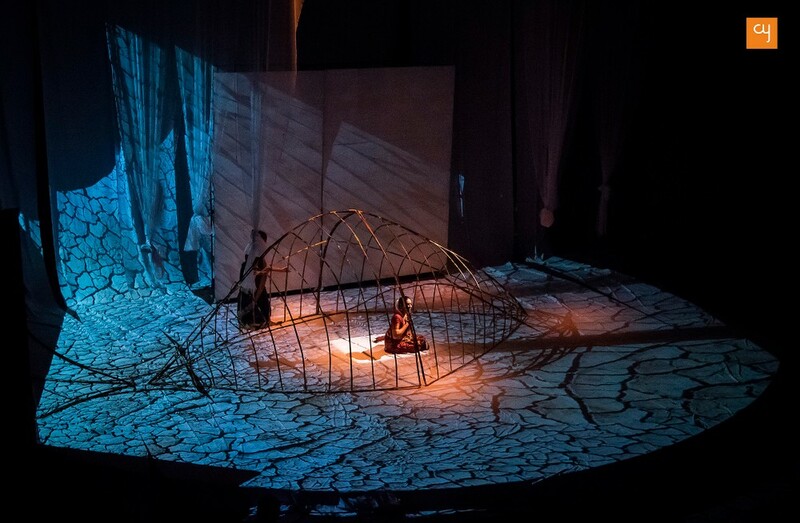 Under his direction in this special production Mother River, without Darpana’s beloved Amma sitting upright in a chair with sharp eyes behind all rows to watch, the anchoring image initially is of Sonal Solanki as a river that is celebrated through a song. She sings of her flow from region to region, of women and children bathing, of birds and beasts. All that is now a memory. The river takes on hues of the nostalgic memories of a tradition Mrinalini brought to Ahmedabad, and India. The nostalgia is made acute by vocalist Aditi’s voice running up to the highest note without words stirringly in Hindustani and Western music. The mood came even closer when she stepped down and walked up the stairs singing. There were images earlier right from the beginning that established the mood. Childhood memories of a girl in a South Indian family who knew she was born to fly and dance. The distant memories were evoked with rather hazy images behind transparent white curtains. Soon enough, as the curtains were pulled down, vigorous beats were played on the mizavu traditional drums of Kerala right in front and behind the last row (music : Sandeep Pillai, M Nair). 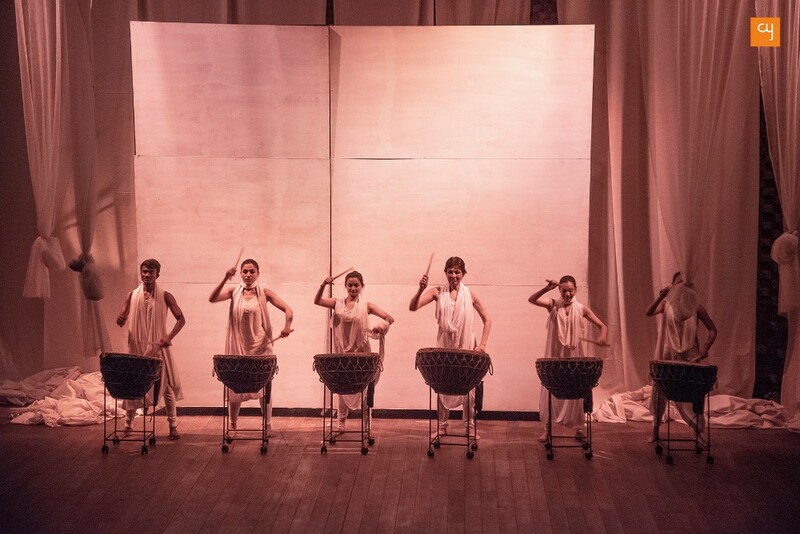 They anticipated delectable moments of varying rows of female players led by Mallika Sarabhai, all in alluring white (costumes : Wendell Rodrigues), who loved to herald a new vision that would carry on the classical legacy in tune with the contemporary audience. The girls played the drums lustily in unison and interactive with smiles and abandon all their own. With their sticks striking the drums up down and in the middle and on the sides, not leaving the brims untouched, and even the sticks striking each other, they loved to produce the rhythm. As the viewers’ hearts pounded with the strong rhythms, all of the players would have danced on them leaving aside their sticks. The irrepressible Mallika, who was on one side in a sequence for a change in fact stepped out for a couple of seconds, sticks in hand, and did dance! The one-hour pithily compact multi-segmented audio-visual show (Brilliant coordination! a young architect by my side exclaimed), abounded in suggestion, silent moments and an evocative creative power. The heard and the seen evoked much that was not heard and seen. 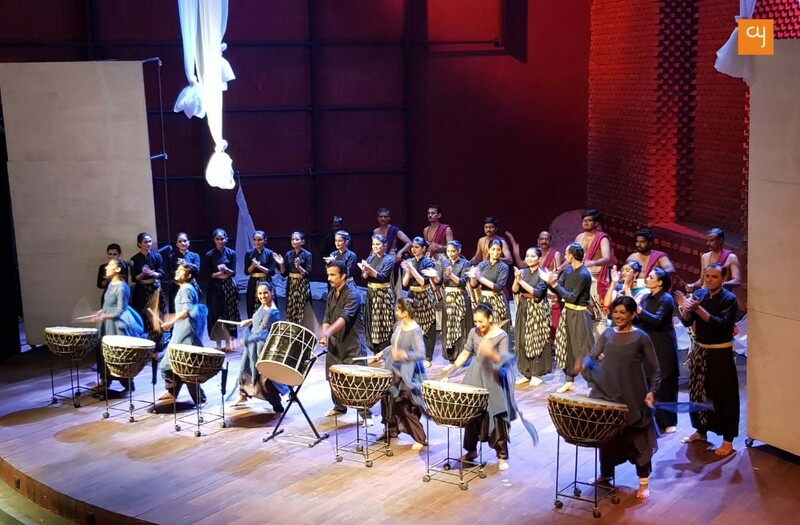 It was reassuring to see tens of young girls beaming with joy besides Darpana’s senior boys and girls becoming indistinguishable parts of a large performing group (Choreography : Mallika). It was good to see a violinist and a pianist of Symphony Orchestra and that talented versatile young singer making significant contributions to the theme of the performance. Among the delicately crafted segments of Mother River was this dainty one in which Mallika and Puja only visually interacted on two white slopes that resembled the roof of the small library that does not exist now. On the roof emerged the two characters, mother and child, both in white, connected with the umbilical cord. Viewers get a feel of the natural connection, the struggle between dependence of the newborn on the mother giving birth and finally the child having an independent existence. The Darpana legacy changes hands and with a promising vision is a fresh beginning made to carry on the legacy.